14 people from Isis spent some or all of the August Bank Holiday down at the seaside near Poole. I don't know what happened on the Saturday paddle as I turned up late, but that evening around the campfire there were tall tales of epic struggles against raging torrents, Gwylim and his amazing catch (that got away despite his heroic swim after it!) and plans for the next days trip. The barbeque was amazing with everyone contributing a delicacy or two - is this a cooking club or a canoeing club? A huge storm blew over the campsite in the night but Sunday morning brightened up as we headed out in to Poole Harbour for a circumnavigation of Brown Sea Island. Dodging the numerous varieties of craft on the water - including the cross channel ferries was more challenging than you'd imagine! At lunch time we spotted a glorious golden sand beach in the distance although by the time we got there the sun had disappeared and the sky had turned a dark shade of bank holiday grey. Our second stop was in Poole for ice creams where we attracted a crowd of over 40 people when we departed. One final leg across the harbour with the swell building and we had returned to our launch site. That evening - having run out of things to burn - we headed into Wareham for fish and chips on the wharf washed down by a selection of local ales. 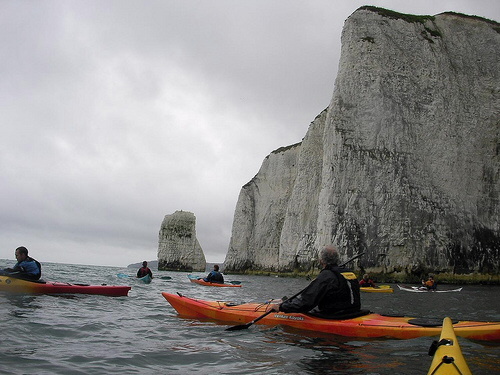 The highlight for most people was Monday's paddle along Studland Bay to Old Harry Rocks - giant towering chalk stacks that rise out of the sea. The sea was relatively calm but still a little frisky so we could paddle between the stacks and through archways and into caves. 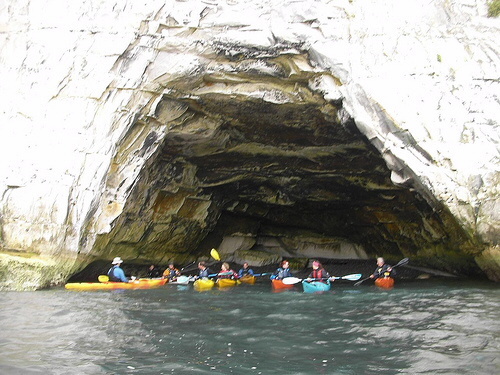 As we headed towards the start of Swanage Bay the sea became more violent and paddling became a little more tricky - which was great for practising our newly acquired sea kayak skills. As we returned to Studland Bay the sea had risen a little allowing us to shoot through a tiny archway in the rocks. Then a quick dash across the bay led us back to shore and the National Trust café for lunch. Thanks to Barry for leading us safely throughout the weekend, Penny for arranging the logistics and everyone for the laughs and good humour during the weekend! 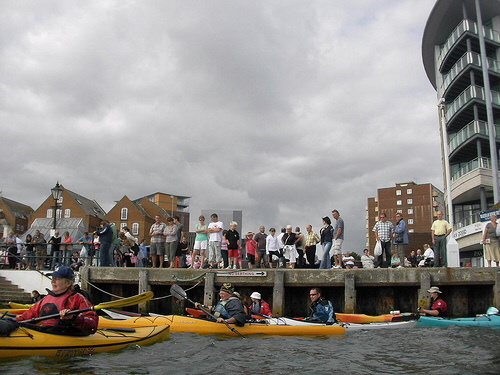 Poole Harbour provided a great introduction to sea paddling for some of the *** thirteen Isis and *** Exeter Canoe Club members who headed out into the briney on the Saturday of the Bank Holiday weekend. Day One a gentle paddle around the western 'shallow end', hunting the elusive Piddle (don't ask, Penny's idea). Then, well an amazing campsite near Corfe Castle: more like a rock festival really with star features such as fun mud to slide vehicles on, six scenic loos and four cold taps for several hundred people. Great barbeque though. 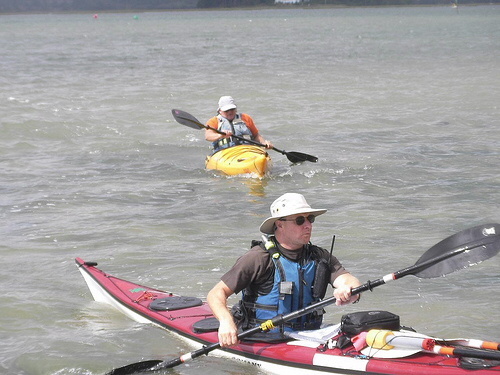 Day Two a more serious paddle taking in Long, Round and Brownsea islands, crossing the Poole Harbour entrance near the chain ferry. Became a little choppy here with plenty of traffic and we were pleased to avoid Brittany ferries' Condor catamaran on its outward journey. 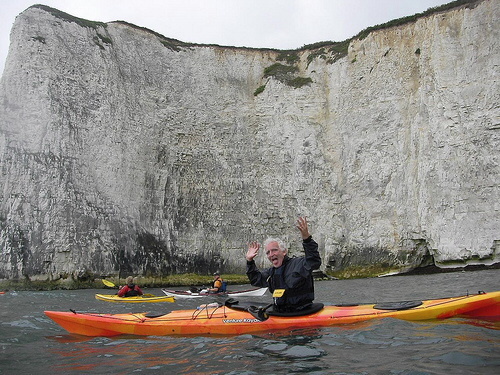 By this stage a serious kayak fishing group had emerged who were rewarded with a mackerel. Most of us were taken aback by the Moth class hydrofoil dinghies, apparently sailing at high speed a metre above the waves, supported on a lolly stick. Next the serious entertainment which took place at Poole Quay, prime holiday hotspot for catching boats, spending money and - the attraction for some of our group, buying ice cream. This involved hauling numerous sea kayaks up onto the quay via narrow slippery steps into a startled ?admiring? Perhaps disbelieving, crowd of holiday makers and boatmen. Much to everyone's disappointment nobody fell in although it was perhaps touch and go. The angling group missed a trick here, a few stylish rolls could have drawn applause and possibly money from the crowd which would have helped towards fish and chips (and the yuk veggie pineapple-fritter option) at Wareham Quay in the evening. Day Three; well just great. 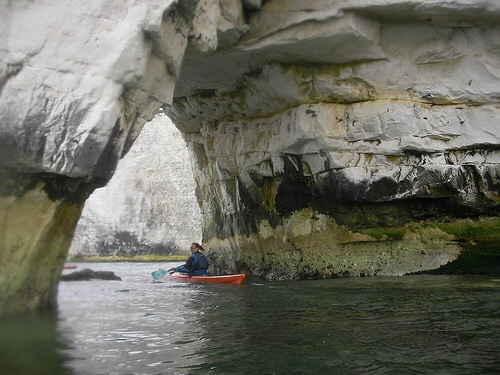 A paddle out from the quiet calm of Studland Bay to The Foreland and then beside the chalk stack of Old Harry, and along the geologically convoluted chalk cliffs which rose about a hundred feet above our heads with the coastal path on top. Some inviting sea caves here; everyone managed at least one. The gentle swell became a bit lumpy as we approached Swanage Bay, so at Ballard Point we turned and took the opportunity of exploring some narrow slots with mini-races by Old Harry on the return to Studland. Very many thanks to Barry of ** Exeter Canoe Club for quietly keeping a weather eye on us all and to Penny for masterminding most of the rest.